Senator Godswill Akpabio, who had defected from the Peoples democratic party,PDP to the APC has said though he is not God, he has the assurances that President Muhammadu Buhari will return to power. 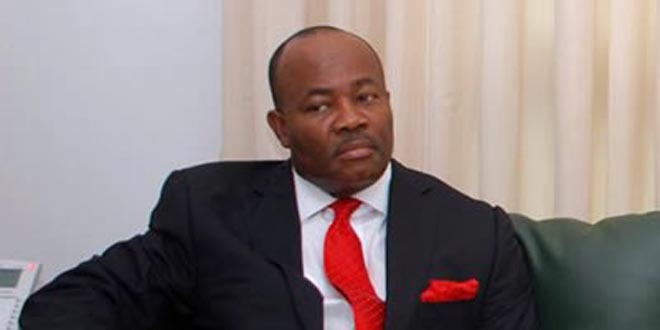 While in the PDP until defection, Akpabio was the senate Minority leader. He made the declaration in an interview with journalists. He said God had designed Buhari to help the country at this point and that he decided to defect from the Peoples Democratic Party (PDP) to the All Progressives Congress (APC) to help the president stabilize the country. “I am not God and I am not also a prophet but sometimes God reveals things to people that he loves and I know God loves me because I love God. “The projection is that in terms of the political rigmarole that is going on in terms of alignment and realignments, 2019 victory will belong to the All Progressive Congress (APC) and most especially President Muhammadu Buhari will be returning for a second term in office. “I am saying so because God loves Nigeria. This is a man we have tried for so many years to be president of the country. “One time he gave himself that he was no longer going, he thanked all the supporters but from nowhere, a group of people, some from PDP and APC came together and went back to appeal to him to come and they even opted to buy the form for him to come. “In spite of his resistance, he came and then of course confusion entered into the PDP family and God is a master designer, he eventually emerged president,” he said when he was asked what he thinks about the 2019 election. He explained that when Buhari emerged president of Nigeria, Goodluck Jonathan did not wait for the final result of the election before calling to congratulate him. “I believe that in 2015 we all had our choices but God had his way and when God has a hand in something, I don’t think God is a master of uncompleted projects. “This was not a decision of man, this was a decision of God and therefore God can give him the second term through Nigerians and you can see why I will be bold enough to say so that you can see the kind of political personalities that he continues to attract despite the rigmarole of some members of his political party. “That is why I can project that come 2019 general elections the APC will become victorious,” he added.